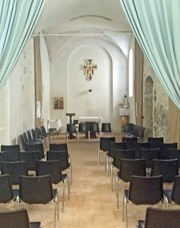 This ancient church at 18 Via della Misericordia (now the Cappella di San Pietro) can be visited on request to the Istituto di San Carlo, which has its office at 18 Via Saffi). The church was first documented as San Pietro de Pusterla in 1213. Its name suggests that there was a small city gate (pusterla) nearby, albeit that this putative circuit of walls was extended in ca. 1240, after which this gate was presumably demolished. The Barnabite fathers, who built the nearby church of San Carlo (below) in 1613-23, bought San Pietro Pusterna in 1614. The church probably served as a sacristy, and the Barnabite college was extended into the space above it. 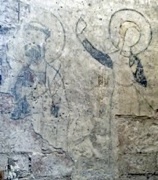 The frescoes that have been discovered under the plaster on the right wall are the oldest to survive in Foligno. The Barnabite fathers built this Baroque church, which was probably the first in Italy to be dedicated to St Charles Borromeo. 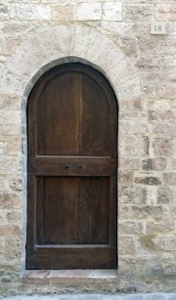 The first stone was laid in 1613, a year after the Barnabites’ arrival in Foligno. Construction was completed a decade later. The Barnabites purchased the buildings to the right of their church for their college in 1614. These included the church of San Pietro in Pusterna (below). They left the church itself in tact internally, but extended the college into the space above it. The facade of the church, which was built in two distinct phases was never completed. 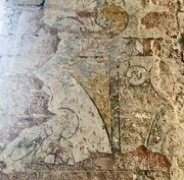 The entrance to the adjacent college (at number 18 Via Saffi) has a damaged fresco of St Peter (standing, and holding a sword in his right hand) above it. The complex was closed in 1810 but managed to re-open, closing definitively in 1860. It has housed the Teatro San Carlo since 1933. Return to to Walk II.